I’ve been looking for instructions on how to make an “inside step card”. All of those I’ve found so far either need a template or a Scan’n’cut. During my searching, I came across this really gorgeous Inside Block Card. Although there’s a lot of decorating to my card, it is simple to make! I used retired cardstock for my first two attempts. The first card I worked to the same size as the video I saw. From there it was easy to make the card a bit smaller so it would fit into one of our standard envelopes. The finished size of my card is 4″ x 6″. The first almost-correct card I made is the Lemon Lime Twist card. I folded my card the wrong way round and finished up with the bottom box bar – which is ¾” high – at the top of my card. Fortunately it’s a very small detail and doesn’t really affect anything. 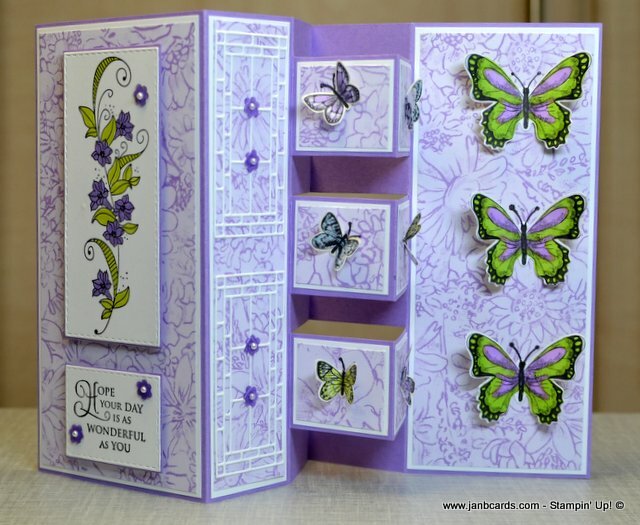 The large butterflies I’ve used are the black and white large ones that can be punched out from a sheet of Botanical Butterfly Designer Series Paper (DSP). I tried colouring them with Stampin’ Write Marker Pens, and but changed to Stampin’ Blends. Although I had to improvise with certain colours, the Blends worked so much better! All the small butterflies were also punched from a sheet of the DSP. They were ready coloured. 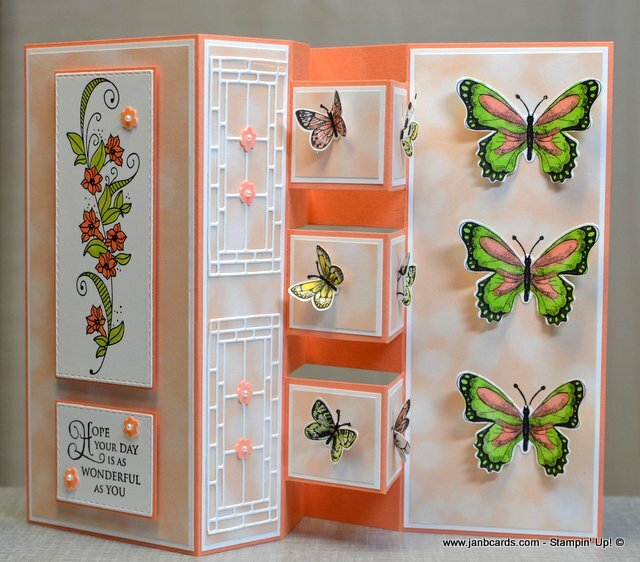 I chose the swirly flowery image from the Beauty Abounds Stamp Set. I find this image such a pleasure to colour, especially if I use Stampin’ Write Marker Pens. To decorate the middle panel, I die cut two windows using the Stained GlassThinlits Dies. The second card I made just before I started videoing, I decided to use the Multipurpose Adhesive Sheets. They are such a pleasure to use! I just love it. I thinking of making it for my dear friends birthday. Hope you don’t mind. What beautiful cards. The purple is really my thing also the butterflies. I will make one for our daughter’s birthday. Thank you Jan.
Hi, Marigold. I’m so pleased this card has caught your imagination, your daughter will be thrilled! Many thanks. Happy crafting, JanB. JanB, you your videos and instructions are the sweetest things you do for us all to benefit from. Thank you so much that you take the time to break them down to inches. You are the best. I love your web site and your cards.